Aim: The present study was undertaken to assess the accuracy of pediatric echocardiograms done at non-tertiary centers and to evaluate the relationship of inaccurate interpretations with age, echocardiogram performer and complexity of congenital heart disease (CHD). Materials and Methods: The echocardiogram reports of 182 consecutive children with CHD (5 days-16 years) who were evaluated at a non-tertiary center and subsequently referred to our center were reviewed. Age of the child at echocardiogram, echocardiogram performer and complexity of CHD were noted. These reports were compared with echocardiogram done at our center. Discrepancies were noted and categorized. To assess our own error rate, we compared our echocardiogram reports with the findings obtained during surgery (n = 172), CT scan (n = 9) or cardiac catheterization reports (n = 1). Results: Most of the children at the non-tertiary center (92%) underwent echocardiogram by personnel other than a pediatric cardiologist. Overall, diagnostic errors were found in 69/182 (38%) children. Moderate and major discrepancies affecting the final management were found in 42/182 (23%) children. Discrepancies were higher when the echocardiogram was done by personnel other than pediatric cardiologist (P < 0.01) and with moderate and high complexity lesions (P = 0.0001). There was no significant difference in proportion of these discrepancies in children ≤ 1 year vs. >1 year of age. Conclusions: A significant number of pediatric echocardiograms done at non-tertiary centers had discrepancies that affected the management of these children. More discrepancies were seen when the echocardiogram performer was not a pediatric cardiologist and with complex CHD. With increasing awareness of congenital heart disease coupled with easy availability of echocardiography as a non-invasive tool, many children with suspected congenital heart disease get screened for their heart disease in centers primarily oriented to evaluate adult cardiac patients. Echocardiogram, in addition to a detail history, examination and/or chest radiogram may be sufficient in most of the cases with suspected congenital heart disease to guide the parents. Though this is a common practice in the Indian scenario, there is potential for serious errors in cases where the interpreter is not equipped with the expertise to adequately diagnose children with complex heart disease. The purpose of the present study was to assess the accuracy of pediatric echocardiograms done at non tertiary centers. One hundred and eighty-two consecutive children with congenital heart disease admitted for in-patient management at an inpatient unit of a tertiary cardiac center who had an echocardiogram done at a non-tertiary center prior to evaluation at our center were included in the study. Patients who did not have a previous echocardiogram done or did not have their previous reports were excluded. The study was conducted over a period of 5 months. The demographic, clinical and laboratory details were recorded using standardized case record forms. The electrocardiogram and chest radiogram findings were also noted. At our center, the pediatric echocardiogram was performed by a trained pediatric cardiologist in an echocardiography room with a comfortable environment. Sedation was used as and when required. After the basic work up, 172 patients underwent surgery. Ten patients who did not undergo surgery underwent either a CT scan (n = 9) or catheterization (n = 1). The discrepancies between echocardiograms done at primary centers and echocardiograms done at our center were noted and further categorized as shown in [Table 2]. The findings of the echocardiograms done at our center were verified with the operative findings or cardiac catheterization/CT scan findings when operative findings were not available. Continuous variables were expressed as range and median and the categorical variable as proportions (%). Fisher's exact tests and McNemar test were used for comparison of categorical variables. In all analyses, a p-value of 0.05 was considered statistically significant. The analysis was performed using SPSS ver. 19.0 (IL, Chicago, USA) software. The age of the patients ranged from 5 days to 16 years (median age of 10 months). One hundred and four (57%) children were less than 12 months, 52 (29%) were between 1 and 6 years of age, 17 (9%) were between 6 and 12 years of age and 9 (5%) children were more than 12 years of age. Echocardiograms at primary centers were done by pediatric cardiologists, adult cardiologists, technologists and others in 13 (7%), 153 (84%), 3 (2%) and 13 (7%) patients, respectively. Majority of children underwent echocardiogram by personnel other than pediatric cardiologists (n = 169; 93%). In children less than 1 year of age and more than 1 year of age, echocardiogram was done by personnel other than pediatric cardiologist in 96% and 89% of cases, respectively. There were 40 (22%) cases with low anatomic complexity, 136 (75%) cases with moderate complexity and 6 (3%) cases with high complexity. In children less than 1 year of age group, 85% had moderately complex lesions as compared to children above 1 year (62%, P = 0.01).The complexity of cases done by pediatric cardiologists and personnel other than pediatric cardiologists were similar. One hundred and thirteen (62%) reports done at the primary center were found to be congruent. Thirty-eight percent (69/182) had discrepancies of which 27 discrepancies were minor (2A), 17 were moderate (2B) and 25 were major (2C). The moderate and major discrepancies have been listed in [Table 3]. Moderate to major discrepancies (group 2B and 2C) were found in 26% of children less than 1 year of age and 19% of children more than 1 year of age and there was no significant statistical difference in between the age groups. The discrepancies affecting the management of the child were significantly higher in echocardiograms performed by personnel other than pediatric cardiologist as compared to those performed by pediatric cardiologist (24% vs. 8%, P < 0.001, McNemar test) [Figure 1]. No moderate or major discrepancies were noted in children with low anatomic complexity lesions. However, in children with moderate and high complexity lesions, 29% and 50% of the echocardiogram reports respectively had significant discrepancies affecting the management of the patients as compared to our echocardiograms (P = 0.0001) [Figure 2]. Echocardiograms done at our center correlated with the operative findings/catheterization/CT scan findings in 180 (98.9%) cases. We found two reports with discrepancy, one in 2A and other in 2B category. One was a patient with Tetralogy of Fallot, who had moderate pulmonary stenosis on echocardiogram and was found to have severe pulmonary stenosis per operatively. The second patient, reported to have moderate ventricular septal defect with no pulmonary hypertension on echocardiogram, was found to have a large ventricular septal defect with dilated and tense pulmonary arteries intra operatively. Congenital heart disease is the most common congenital malformation. Echocardiography is the primary imaging tool in the diagnosis and assessment of congenital heart disease and is considered to be the gold standard. , Though this technique is safe and non-invasive, it is operator dependent. Accurate interpretation of an echocardiogram done in a child depends on the sound knowledge of congenital heart disease, systematic adequate collection of data and the amount of experience. Additionally, it is important to consider changes that occur as a result of transition from fetal to adult circulation. Though the burden of congenital heart disease is huge, the number of pediatric heart programs and trained pediatric cardiologists in our country are inadequate and clustered in parts of India with improved economy. Hence, it is common for pediatric echocardiograms to be performed and interpreted by professionals other than trained pediatric cardiologists. Many echocardiograms done, especially at remote centers may be normal and that would be quite reassuring to the parents. However, inaccurate diagnosis at an initial stage can delay or deny a satisfactory outcome to a child with congenital heart disease. In the past, diagnostic errors have been reported in approximately 40% of echocardiograms done by non-pediatric cardiologist. ,, Among these errors, majority have been found to be of moderate to major category. Delayed diagnosis has been seen to be associated with fixed pulmonary vascular disease, hypoxemic spells and severe metabolic acidosis. In our study, most of the externally done echocardiograms (93%) were done by individuals other than pediatric cardiologist. 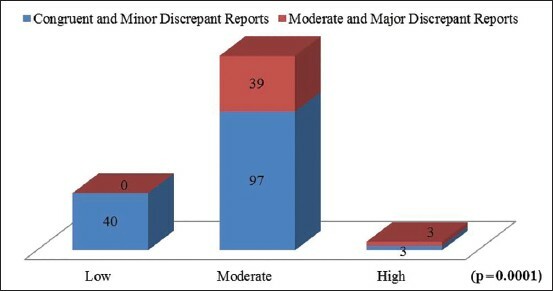 Out of 182 cases, 42 (23%) had moderate or major discrepancies affecting the management. The common congenital heart diseases which were missed in our study include total anomalous pulmonary venous return, transposition of great arteries, aortic arch anomalies in severely discrepant group. Aortic valve disease/aortic regurgitation in outlet ventricular septal defects, branch pulmonary arteries/coronaries in Tetralogy of Fallot were among the moderately discrepant group. The factors which could also have affected the quality of the study include study location, use of sedation, image quality or even data entry errors. At primary centers in India, many of these factors could have an impact simultaneously. Our study is not truly reflecting the percentage of errors made at primary centers and the actual impact of missing a major congenital heart disease, as the study was limited to patients admitted for a procedure. Hence, we are expected to miss patients who never reached the hospital or were not planned for an intervention. Diagnostic errors can happen at any place. However, the knowledge that certain cardiac conditions can be missed in a specific scenario and ways to pick them up is important. This information can serve as the basis for quality improvement of echocardiograms and reduce diagnostic errors. Whenever severe pulmonary arterial hypertension is diagnosed, it is important to make sure the pulmonary venous return is normal (to see if inferior vena cava has an additional venous entry), the arch is normal and not to miss an aorto-pulmonary window, muscular ventricular septal defects, origin of one pulmonary artery from aorta and absence of one pulmonary artery. In presence of left ventricular dysfunction, it would be necessary not only to see the arch from the suprasternal view but also make sure the descending aortic tracing at diaphragm is satisfactory not to miss a low thoracic or abdominal coarctation of aorta. Also important is to check for coronary anomalies when there is ventricular dysfunction. Transposition of great arteries can be suspected by the great arteries not crossing each other. 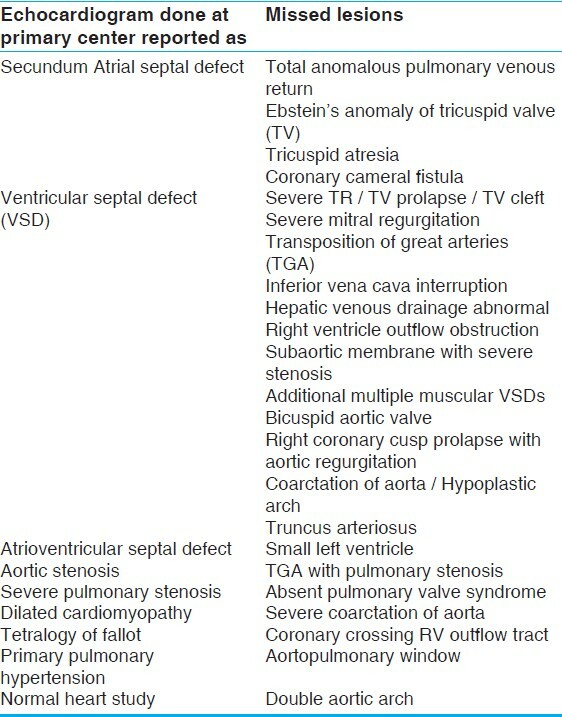 Cardiac total anomalous pulmonary venous connection to coronary sinus can be mistaken as primum atrial septal defect as in both the conditions color Doppler will reveal a left to right shunt close to the atrioventricular valves and hence it is important to confirm that the pulmonary veins are connected to left atrium on 2D as well as color Doppler. Coronary arterio-venous fistula entering into right atrium will have flow entering the right atrium on color Doppler which can be mistaken as secundum atrial septal defect, thus any dilatation of coronary artery which will happen with coronary cameral fistula should raise the suspicion. It would also be beneficial to have the knowledge of common associations with a particular heart disease e.g., coarctation of aorta with ventricular septal defect and aortic valve prolapse with outlet ventricular septal defect. At the primary centers, along with the echocardiography, detailed clinical evaluation and few investigations such as pulse oximetry can help to identify cases of congenital heart disease and to reduce the incidence of diagnostic errors. Whenever the clinical situation cannot be explained by the echocardiographic diagnosis especially in sick neonates or in cases with severe pulmonary arterial hypertension, it would be important to have a second look or even be open to get a second opinion. It is our institute's protocol to repeat all echocardiograms prior to surgery as routine. This ensures a "double check" and also makes a surgical plan reassuring. The diagnostic errors can lead to not only under-diagnosis but also sometimes over-diagnosis. The knowledge of benign conditions like prominent thymus gland or prominent chiari network is important to reassure the parents. In the past, studies have been done to assess a correlation between the incidence of diagnostic errors and patient's age or complexity of diagnosis. Stranger et al. did not find any correlation between incidence of diagnostic errors and patient's age or complexity of diagnosis. However, a different opinion was given by Ward et al and Dorfman et al wherein errors were commonly seen in less than 1 month of age and with increasing diagnostic complexity. , In our study, we found a significantly high incidence of mismatch in children with moderate and high complex lesions. Though moderately complex lesions were common in less than 1 year of age, we did not find any correlation of mismatch with age of child. In our country, where we do expect a number of pediatric echocardiograms to be done by non pediatric cardiologist, systematic training of these operators to identify the errors which can be prevented, would improve the quality of diagnostic imaging and make an impact on the final outcome of children with congenital heart disease. Telemedicine and real time guidance echocardiography may be feasible and could help build capacity in remote locations. Benavidez OJ, Gauvreau K, Jenkins KJ, Geva T. Diagnostic errors in pediatric echocardiography: Development of taxonomy and identification of risk factors. Circulation 2008;117:2995-3001. Hoffman JL, Kaplan S. The incidence of congenital heart disease. J Am Coll Cardiol 2002;39:1890-900. Lai WW, Geva T, Shirali GS, Frommelt PC, Humes RA, Brook MM, et al; Task Force of the Pediatric Council of the American Society of Echocardiography; Pediatric Council of the American Society of Echocardiography. Guidelines and Standards for Performance of a pediatric echocardiogram: A report from the task force of the pediatric council of the american society of echocardiography. J Am Soc Echocardiogr 2006; 19:1413-30. Mertens L, Friedberg MK. The gold standard for noninvasive imaging in congenital heart disease: Echocardiography. Curr Opin Cardiol 2009;24:119-24. Kumar RK, Shrivastava S. Paediatric heart care in India. Heart 2008;94:984-90. Hurwitz RA, Caldwell RL. Should pediatric echocardiography be performed in adult laboratories? Pediatrics 1998;102:e15. Ward CJ, Purdie J. Diagnostic accuracy of paediatric echocardiograms interpreted by individuals other than paediatric cardiologists. J Paediatr Child Health 2001;37:331-6. Stanger P, Silverman NH, Foster E. Diagnostic accuracy of pediatric echocardiograms in adult laboraties. Am J Cardiol 1999;83:908-14. Ewer AK, Furmston AT, Middleton LJ, Deeks JJ, Daniels JP, Pattison HM, et al. Pulse oximetry as a screening test for congenital heart defects in newborn infants: A test accuracy study with evaluation of acceptability and cost-effectiveness. Health Technol Assess 2012;16:v-xiii, 1-184. Dorfman AL, Levine JC, Colan SD, Geva T. Accuracy of echocardiography in low birth weight infants with congenital heart disease. Pediatrics 2005;115:102-7.